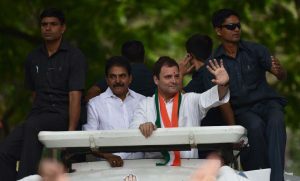 Mandsaur: Congress chief Rahul Gandhi today virtually flagged off the party campaign in Madhya Pradesh, where elections are by the year-end. Speaking at Mandsaur, which is mourning the six farmers who died in police firing last year, he ripped into Prime Minister Narendra Modi’s government, practically counting off the ways in which it has failed the nation’s farmers. Mandsaur was the epicenter of last year’s protracted protests by farmers, which the state police tried to quell midway by opening fire on a group of protesters. Six farmers had died in the firing – their friends and families say justice still eludes them. To mark the first anniversary of the tragedy, angry farmers have planned a 10-day protest in the area. To the farmers, who have been demanding better price for their crops and a loan waiver, Rahul Gandhi said not only had PM Modi let down the farmers, it had also failed to help industry. Its Make in India initiative, he said, has been a resounding failure, especially when Indian markets have been taken over by Chinese goods. “Make in India is a failure. Everything is made in China, China, China… And our PM is swinging on a swing with the Chinese leader in Gujarat… The Chinese army got into Doklam, still Narendra Modi doesn’t utter a word,” he said. If the Congress came to power in the state, it would “change the lives” of the farmers, he said. Addressing the key demands of the farmers, he promised crop loan waiver within 10 days of taking over and justice for the farmers killed in police firing. He also promised that if the party come to power, it would “Make in Mandsaur”. Food processing units will be built in every district so the farmers can take their crops to these units straight from the field. “Within 10 years, Beijing will be consuming the garlic of Mandsaur if we come to power,” he said.